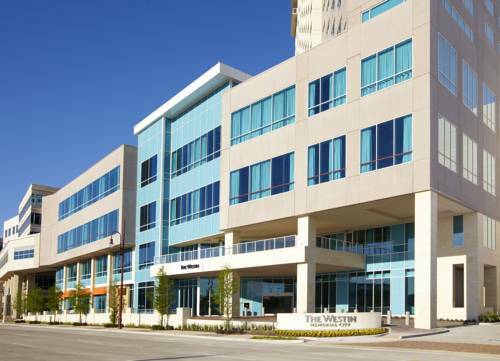 A relaxing oasis, The Westin Houston, Memorial City is located in the heart of the vibrant Memorial City District and adjacent to Memorial City Mall. Enjoy close proximity to Westchase District, the Energy Corridor, and the evolving CityCentre area. Ample meeting space and top-notch amenities make it easy to transition from day to evening in absolute comfort. From a roof-top infinity pool and WestinWORKOUT Fitness Studio to the splendid setting and food at 024 Grille, renewal is always at hand. Our 289 contemporary guest rooms and suites invite you to simply settle in and leave your cares behind. Each room features our signature Westin Heavenly Bed, the spa-like Heavenly Bath, plush armchairs with ottomans, and a flat screen TV. Known as both the Bayou City and the Energy Capital of the World, Houston is a diverse and cosmopolitan city that offers world-class arts and entertainment. Voted third most livable city in the U.S., it's home to NASA, Minute Maid Park, Toyota Center, Reliant Stadium, and San Jacinto State Historical Park. Located in the heart of the exciting Memorial City District, the hotel connects to the Memorial Hermann Medical Center and Memorial City Mall via skywalk. The mall offers an extraordinary shopping experience with a large variety of national and international brands and stores. A family-friendly destination, the Memorial City Mall is also home to the Cheesecake Factory and Cinemark 16-screen movie theater, a double-decker carousel, Ice Skate USA, the Childrens Play Castle, and the Loco-Motives train. We also offer close proximity to the Energy Corridor, Westchase District, and Citycentre a new pedestrian-friendly, European-style open air plaza featuring local and popular retailers, dining establishments, farmers markets, and family-friendly entertainment. Nearby Towne & Country Village offers dining, retail, and specialty establishments with a three-story shopping mall and adjacent shopping plaza. A local bistro atmosphere and Texas steakhouse traditions form an irresistible combination at 024 Grille. Cuisine by Executive Chef Patrick O Connor adds twists to classic dishes and new favorites. Ingredients Caf offers delicious takeaway meals for breakfast, lunch, and dinner and proudly brews Starbucks coffee. Choices include light sandwiches, salads, pastries, and SuperFoodsRx selections all created with your health in mind. 024 Lounge, named after the prestigious zip code in which it resides, is a favorite gathering spot for small bar bites and signature cocktails in a relaxing setting, complete with a cascading waterfall, all on the hotel s ground floor.